LAM SpA is the Italian leader company in the design, development and marketing of roof hatches, roller blinds, sunshades, and plastic components made by injection and thermoforming technologies. Thanks to constant product and process innovation, excellence in service and the highest quality of materials, LAM SpA has been at the top for more than 50 years in bus accessories, trucks, industrial vehicles, agriculture machinery, earthmoving machinery, camper and caravn, trains and boats. LAM SpA was able to grow without losing sight of his founder’s values: Cavaliere Livio Gozzi. 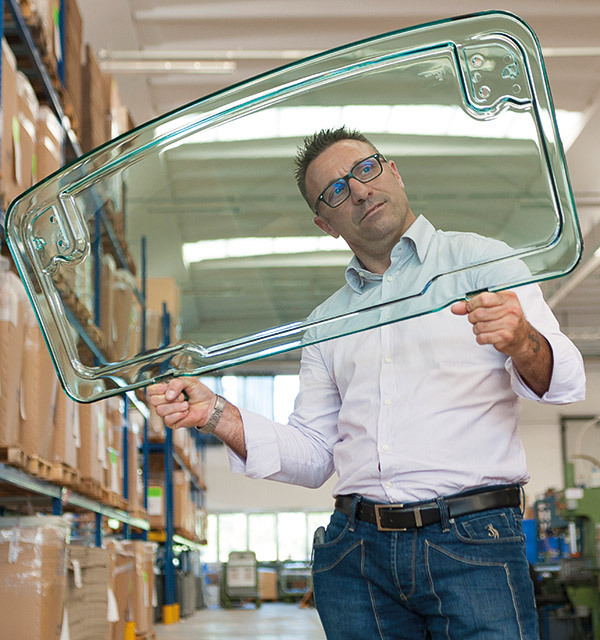 Born in 1960 as LEM, Lavorazione Emiliana Metalli, it realized accessories for bus and coach in a craftsman-family dimension. In 1961, the turning point: Livio Gozzi patents the innovative prototype of a roller blind, and the company is living its first great moment of development. In order to fulfill the amount of requests, the company needs to automate the production process, enlarge its headquarters, which in 1971 was established in Spilamberto, province of Modena. LEM transforms its name into LAM Srl. Today LAM SpA is a leader in the production of roller blinds, hatches and plastic parts in Italy, Europe, North Africa and the Middle East. Proud of his own story made of engagement, dedication, ability and responsibility, LAM SpA recognizes the values that have always been the basis of its success and makes it the pillar of its activities, to stand out on the international market and be recognized as a valuable partner. LAM SpA’s strength is its 100% Italian production: highest quality materials, skilled labour, Italian suppliers and technicians for a top level product. A branched network of dealers and commercial agents enables LAM SpA to meet every kind of request in a very short time. The internal technical study guarantees buyers maximum flexibility in terms of customization and co-design. A constant investment in research and innovation forms the basis for every LAM SpA’s product; it is intended not only to provide cutting-edge technology, but also the presence of exclusive and creative components. The company makes use of a photovoltaic plant which provides the new headquarter with a great amount of energy. Its aim is to produce responsibly, and to adopt an ecological approach to work. LAM SpA’s strong presence on Italian, European, North African and Middle Eastern markets makes the company a solid and stable partner. To grow even further, LAM SpA wants to increase its successes thanks to a refined internationalization strategy, which will lead it to conquer new markets and once again show off Italian quality all over the world. Since January 2012, a new production plant in Brest (Belarus) is active: this allows LAM SpA to expand its markets to the East, and to provide a better service to its customers located in Belarus, Russia, Ukraine and Kazakhstan.